For international travelers, foreign transaction fees are the devil. If you aren’t familiar with these fees, you should pay attention. Most credit cards will charge a ridiculous 1-3% fee on all purchases processed outside of the US. Note: you don’t even need to leave the country to get hit with these fees – if you ever purchase something and the vendor processes the charge outside of the US, you can expect to get dinged with the nuisance fee. However, the biggest concern is if you take a trip abroad since expenses (and these fees) rack up quickly. For example, if you go to London and spend $3,000 on your US Airways Mastercard, you will have to pay an additional $90 (3%), just for allowing Barclays bank the pleasure of processing your transactions. Even though you’d earn 3,000 miles, you can actually buy them cheaper from US Airways directly via their current 100% bonus at 1.8 cents a mile versus what amounts to 3 cents each with Barclays. Before you travel abroad, make sure you know if your card currently has a foreign transaction fee and the best way is to call customer service. Also beware that while abroad many vendors will ask you whether you want to charge the purchase in the local currency or in US Dollars. I recommend choosing the local currency and letting your bank/credit card company process the charge using their foreign exchange rate. When you allow the vendor to do it, you can almost be assured they are taking a cut of the action and will not give you the best rate. While I’ve compiled a comprehensive list below, you should always double check whether the credit card you are applying for has 0% in foreign transaction fees. Do this by clicking the Terms & Conditions link before you submit your application. Foreign transaction fees will be listed under Fees -> Transaction fees table (usually the last fee listed). Sample fee disclosure on a Bank of America credit card application. While foreign transaction fees are a rip-off, the good news is that there are points- and mileage-earning cards that don’t have these fees. If you travel abroad extensively, it’s critical you get one of these cards, especially since there are several with no annual fees. I personally travel with the Amex Platinum and Chase Sapphire Preferred® Card Visa cards in case a vendor doesn’t accept either Amex or Visa, I have an option. 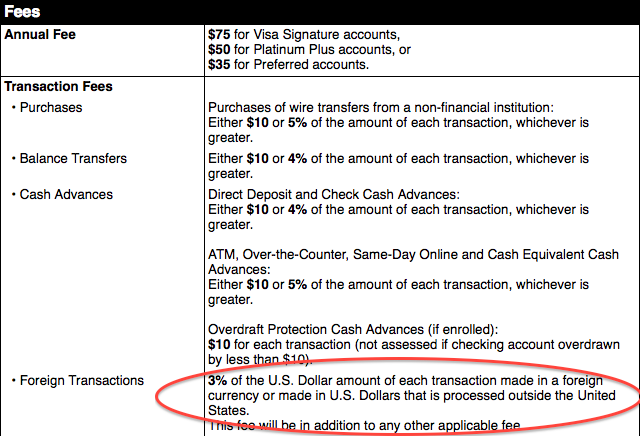 Note: Capital One and Discover both offer 0% foreign transaction fees across their product lines. 50,000 Avios for the Chase British Airways Visa Signature Card. $95 annual fee. 60,000 points (after a year) for the Citi Thank You Premier. $125, waived for the first year. 50,000 points for the Chase Ink Bold. $95 annual fee, waived for the first year. 50,000 points for the American Express Mercedes-Benz Platinum. $475 annual fee. 70,000 points for the Chase Ritz-Carlton Visa. $395 annual fee. 50,000 points for the Chase Sapphire Preferred® Card. $95 annual fee, waived for the first year. 2 Free nights + 1 each anniversary for the Chase Hyatt Credit Card. $75 annual fee. 2 Free nights with the Chase Fairmont Visa. $95 annual fee, waived the first year. 2 Weekend night certificates with the Citi Hilton HHonors Reserve. $95 annual fee. 60,000 points for the Chase Priority Club Visa. $49 annual fee, waived for the first year. 50,000 points for the Chase Marriott Premier Visa. $85 annual fee, waived for the first year. 25,000 points for the American Express Platinum. $450 annual fee. 25,000 points for the American Express Business Platinum. $450 annual fee. 25,000 miles for the Citi Executive AAdvantage World Mastercard. $450 annual fee. 20,000 points for the PenFed Travel card. No annual fee. 20,000 points after $2,000 spent in the first 3 months for Capital One Venture Rewards Credit Card. $59 annual fee, waived for the first year. 20,000 points after $2,000 spent in the first 3 months for the Capital One Venture One Rewards Credit Card. No annual fee. 10,000 points for the Bank of America Privileges card. $75 annual fee, waived for the first year. 10,000 points for the Bank of America Travel Rewards. No annual fee. $100 Statement credit for the Chase United Club Club. $395 annual fee. 5% Cash Back on the PenFed Gas Card. No annual fee. Capital One Spark for Business. No annual fee. If you know of any other fee-free points/miles cards, let me know and I’ll add them to the list.